Posh manager Graham Westley is looking forward to locking horns with Luton Town again. 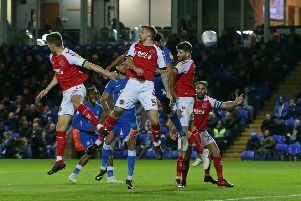 Peterborough United manager Graham Westley has described a second round FA Cup tie at home to League Two side Luton Town as a ‘fantastic draw’. But Westley will ignore the hype surrounding the return of club legends Craig Mackail-Smith and Mark Tyler to the ABAX Stadium as he concentrates on ensuring a third round tie for Posh for the ninth time in 10 seasons. Posh made it into round two with a comfortable 3-0 win at Burton last Saturday (November 7). “It’s a fantastic draw,” Westley said. “We are at home on a pitch we know well and we should have a packed house behind us. “You can’t ask for much more than that, but we are also playing a local rival who will also bring lots of spectators. “In terms of the interest the tie will generate we couldn’t have had a much better one. “Luton probably felt we were like a little brother. They wouldn’t have treated us as a rival even though we were near neighbours as there was no history between the clubs. The tie will be played on the weekend of December 5/6. Ticket price details will be announced soon.